We give you thanks for this day: the first in a new year of life and faith. We can guess what this year might hold. There will be joy, and there will be heartbreak. There will be mistakes, and there will be achievements. There will be hands to hold, tears to dry, stories to tell, and grace to receive. Do not let us miss it, God. Open our eyes, that we might recognize your presence around us. Open our ears, that we might hear your voice in the words of our neighbor. Open our hearts, that we might feel the depth of your love for this world. Open our minds, that we might discover more of who you are. Forgive us the promises we make and do not keep. You are our God, and we are your beloved. Or the to-do lists we tackled. And filled our lives with your grace. Do not let us miss it. Rev. Anna George Traynham is a graduate of Union Presbyterian Seminary (’14) and Presbyterian College (’11). She currently serves as an Associate Pastor at Central Presbyterian Church in Atlanta. You can read more of her writing at her blog And also with you. I live in Charlotte. Last week, on the national news and social media, we became another in a long list of cities which have experienced a violent death, protests, and even riots. Some of you know what we’ve been through. One of the images that will stick with me is a line of Charlotte’s faith leaders, from many faith traditions, standing arm in arm between the protesters and the police trying to be a buffer to keep the protests non-violent. If your setting is like mine there are many different opinions on how or even if to respond to these public events. Typically, pastors may speak from pulpits to bring a witness of our faith tradition to our public lives. I am ordained as a pastor, but my vocation, my call is to lead in educational ministry. 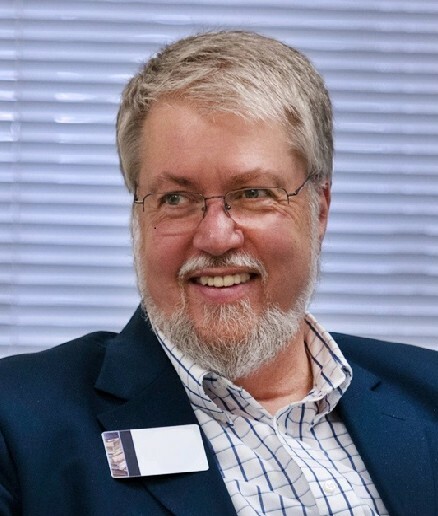 So I want to speak to educators, those on multiple staff teams to be sure, but even more to part-time and volunteer educators serving in smaller congregations across North America. Use these terrible events as teachable moments. Bring the rich traditions of our reformed faith to life by connecting what is happening in the news with what we believe. Look to your confessional statements that address racial and societal injustice. Look to denominational statements released at times like this. Look to prayers and devotions for times of local and national crisis. Look to resources and studies to help your folks understand a bigger picture. Look to the Bible and its relentless call to justice and righteousness. Look to Jesus the Christ who models the compassion of God and God’s inclusion of those we would reject. Look and find and share. If yours is a lone voice, connect with other educators in your area. Cross denominational and even interfaith lines to find a support system for your efforts. Help your people — children, youth, and adults — prepare for the realities of the world we live in. Sometimes you have to stand, arm in arm, between opposing forces to be a faith-based buffer when chaos erupts. But don’t wait for the chaos. Engage in the daily, weekly, ongoing task of forming a people who are shaped by the God of grace, compassion, non-violence, and love. Then, when you are facing the chaos, they will have your back. Join APCE members & friends on this journey of a lifetime to the Holy Land departing April 24, 2017! And hands-on mission workshops you won’t want to miss! The conference will take place at the Denver Marriott Tech Center, which is undergoing a full transformation, scheduled to be complete this fall. With warm colors and artwork indicative of Colorado, guest rooms and meeting spaces are inviting and restorative. The entire renovated hotel has been reserved for the APCE community for this event. The Annual Event team and the Denver local committee have been working diligently to creatively design this Annual Event to inspire you and refresh your spirit and to connect, enrich, empower, and sustain you in your ministry. 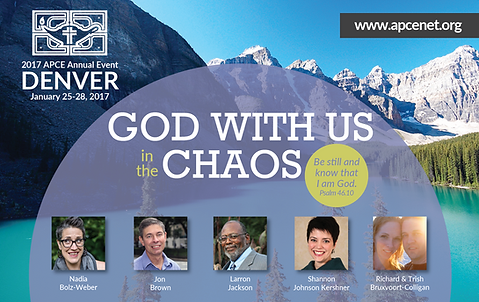 Come to Denver January 25-28, 2017 and experience “God With Us in the Chaos”! Our calling as educators can lead us at times to focus on increasing the intelligence of those in our pews and classrooms. We also focus on building their gifts. But if the result is only surface change, we have missed out on the challenge to nurture the transformation of people at a deep and profound level—where God’s Spirit is shaping disciples to reshape the world. In APCE’s 2015 annual event in Baltimore we proclaimed, Fear Not! This year in Chicago we proclaimed that God is doing a New Thing, See It, Hear It, Live It. Is this not the journey into deeper discipleship—leaving our fear behind and then putting our faith into action? The current series of Advocate articles focus on spiritual practices–but not because we need another thing to do. We focus on spiritual practices because centuries of life as God’s people have shown that it takes practice and discipline to develop, in ourselves and in others, the deeper discipleship that makes deep people. It will take deep people to address the challenges all around us–the decline of Christendom, changes in funding patterns for churches and religious organizations, the deterioration of the role of educator, popular culture that has little need for religion, political culture that forsakes the common good, not to mention global threats to human life. We are called to join in God’s work of bringing in the kingdom of God. God is with us, so we will not fear. God is already at work among us and bids us join in. The spiritual practices of the church can help us develop the depth we need to see and hear God’s work and the courage to live it. So make use of them. Make them part of your inner life. God will use you in the transformation of your people and the world.